I recently reviewed Proporta’s screen protector for the iPod Touch, which I highly recommended all owners to purchase. Although that was good step towards protecting your iPod, it won’t be able to protect the other parts of the device from rough handling or drops. 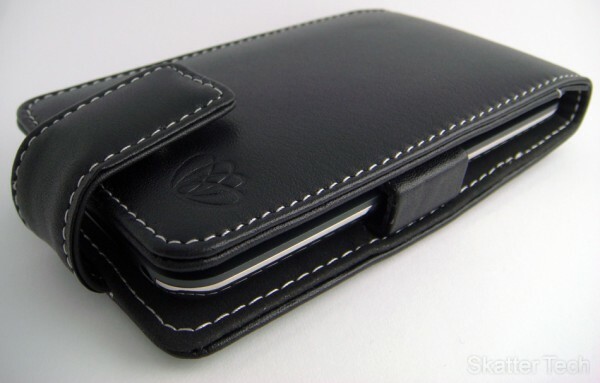 This is where Proporta’s Leather Case for the iPod Touch plays a role. The iPod touch slides in and the case’s clamps hold the device in place and it’s actually quite durable. As the implied in the title with the word “Alu-,” Proporta has actually embedded a strong lightweight aluminum sheet in between the leather layers to protect the iPod Touch even further. The case will be able to protect the iPod Touch from a fairly good amount of pressure. Proporta also includes a belt clip which can easily be removed. All ports and buttons are accessible and no functionality will be lost. As seen in the picture, the bottom is left open so headphones can connected even if the case has been closed. As I’ve mentioned before, it’s a good idea to spend a few bucks to protect your $300-400 investment. Especially since it is something you’ll be carrying around with you everywhere you go. Purchasing a screen protector to go along with this case will offer just about all the protection you can get without loosing usability. If you aren’t a fan of leather cases, take a look at our review of iFrogz’s Silicone Case. Anyways the Alu-Leather case by Proporta is available for purchase on their website. It will cost you $45.95 USD, however you’ll receive a 10% discount if you use the promotion code “skattertech” (no quotes) during checkout. If you know of any better products or have a case you would like us to review, please leave us a comment or send us an email. I recently came in contact with this itouch accessory and agree that it is the best ways to protect your mp3 player. If you are in any way “accident prone”, then you should definitely consider spending the extra cash. I already had problems with a broken itouch really don’t want to try explaining to another Apple employee why their stuff keeps breaking. The metal case, I think works better than any skin you can buy on the market. So if you are considering an itouch or even an iphone you should look up it up on proporta. where do u get one? where do u get it? ?